I have to admit that despite not being under 12, I am and have been a huge Hello Kitty fan for quite a few years. Every time I try to ween myself off having it around the house, she tends to creep back in and I can guarantee every birthday will include something Hello Kitty for me. The world really is your oyster when it comes to Hello Kitty goodies, apart from the usual, I have seen houses, airports and even a machine gun (although I think the latter was a little weird). So with my small Hello Kitty obsession you can imagine how excited I was to hear the first ever Hello Kitty attraction in Europe was to open in the English countryside. On the day of my visit the heavens opened, but that did not deter my trip to my beloved Hello Kitty. The attraction ‘Hello Kitty Secret Garden’ is actually Drusilles parks biggest investment to date, topping a staggering 1 million. Yes it is designed for children and I think I was the only adult there without a child, but it is safe to say the attraction is a must for Hello Kitty fans of all ages. On waiting to meet Hello Kitty, I think the attendant was quite surprised to see that I was meeting her alone. My friend hid round the corner laughing at me, but I wanted my Hello Kitty photo. Rather than taking one with me in it, I gave her a mini hello kitty to take a photo with and her helper asked me in a childlike voice “do you want to sit on the bed with her”, that though I declined. Yes it is designed for children and I think I was the only adult there without a child, but it is safe to say the attraction is a must for Hello Kitty fans of all ages. On walking round the attraction it was really sweet to hear young girls excited saying “I want to go on the kitty ride”. The downpour meant it probably wasn’t as busy as usual, so there were no lines to wait in. My favourite ride were the Hello Kitty cars, although the others looked pretty fab to. The tea cup ride was really cute, with a big Hello Kitty face on every one and the children were also enjoying the sky hopper ride. In Hello Kitty’s palour they were face painting, but I didn’t take it that far and do that. What also impressed me were the prices, a meal with a drink was 8 pounds. Maybe I am used to London, but I expected it to be much more. I couldn’t leave without popping in the Hello Kitty shop and this really was Hello Kitty heaven, I couldn’t help but treat myself to some Hello Kitty goodies and the prices were much less than usual. If you are a Hello Kitty fan or any age, or would like a fun day out with the children. 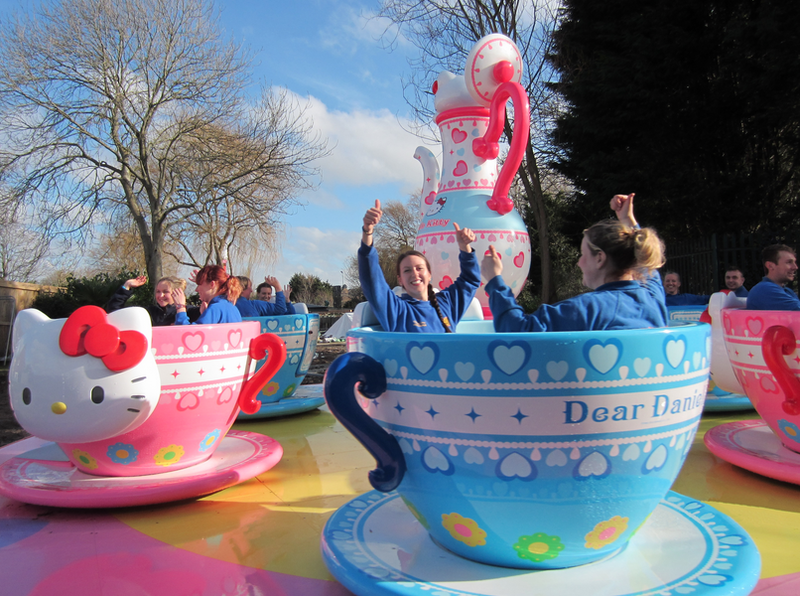 I give Drusillas Park’s Hello Kitty Secret Garden a big thumbs up!